The author shares an inspirational story of her husband who rose above adversity to make a difference in the lives of most people. Follow Dave’s inspirational pursuits to conquer all barriers in life. In the biography “Beyond Barriers” (Page Publishing; 2016) Anne Davey Koomans wrote about her husband, Dave Davey, she tells the deeply emotional story about a man who was struck by polio at an early age. That should have been it but after receiving Christ as his personal Savior and discovering God’s purpose in his life, he rose above his physical ability to fulfill that purpose throughout his life. Aside from sharing Dave’s personal story and their wonderful times and experiences together as husband and wife, Koomans also details his work with Kansas Senator Bob Dole on the National Barrier-Free Architectural and Transportation Board that helped develop the standards for the Americans with Disabilities Act of 1990. Readers will also be captivated by the anecdotes she shares in the book; in one of those anecdotes, she recounts how her husband held a ship in port for several hours as the staff devised a plan to get him abroad so they could depart. “He wanted this book to be written to inspire people who meet a person in a wheelchair to see past the chair,” said the author about her purpose in publishing her husband’s story. Be inspired by Dave’s optimism and determination amidst physical challenges. 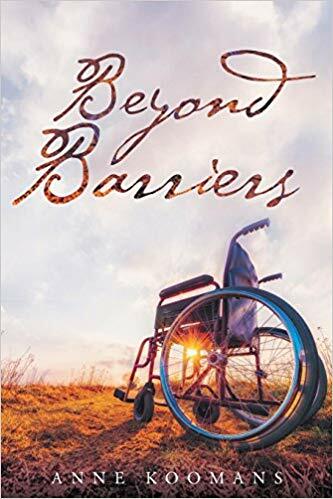 Get a copy of Anne Davey Koomans’ “Beyond Barriers” today through Amazon and Barnes & Noble. Await the public display of this inspirational, captivating read at the upcoming Los Angeles Times Festival of Books on April 13-24, 2019 at the University of Southern California in Los Angeles, CA. Anne Davey Koomans is a wife, mother, and grandmother currently residing in Michigan.